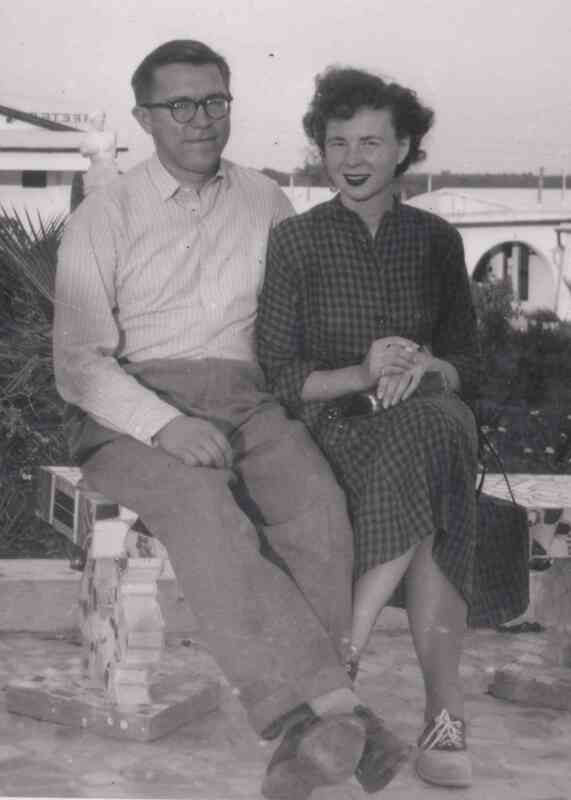 Joe and Freda (Sehnert) Grimshaw Bice lived in South Dakota and made a “once-in-a-lifetime” trip to Acapulco, Mexico with friends Ben and Vera Rasmussen (and Ben and Vera’s daughter and son-in-law) in about 1951. According to Fay Bice, Joe and Freda’s daughter-in-law, they enjoyed the trip immensely. Joe took many photos that recorded many of the stops, and a photo album was purchased for the photos in Mexico. This album is currently in the possession of Fay Bice. 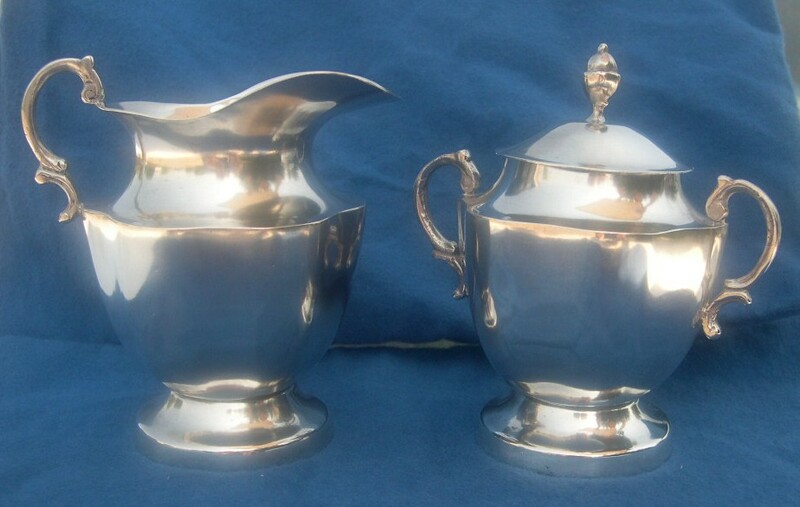 Among the items purchased by Freda and Joe was a silver-plated cream and sugar set with “Taxco” imprinted on each piece. Fay Bice eventually came into possession of the set and passed it on to the website author, who presented it to his daughter as a wedding gift. 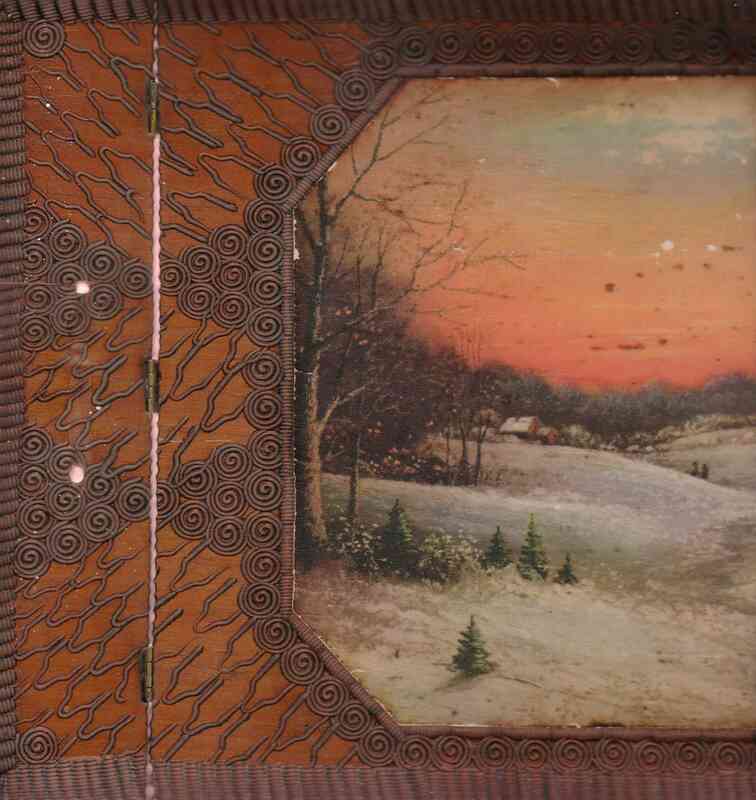 The photo album was used to chronicle Joe and Freda’s trip as a way of providing context for the gift and making it more meaningful. This webpage is based on that chronicle, which was prepared for the August 2003 wedding. 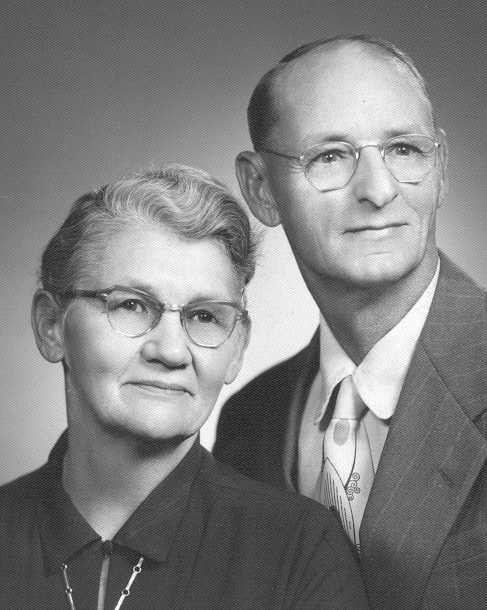 Freda Bice is the subject of a companion webpage, and Joe is a descendant of Charles and Rebecca (Richmond) Bice, who are also the subject of a companion webpage. Thanks go to Fay Bice for making the Mexico trip album available. The narrative prepared for the wedding gift is presented below along with the photos from the Mexico trip album. A file containing the original narrative can be seen by clicking here. The entire photo album in its original condition can be seen by clicking here. Freda & Joe made the trip (to Mexico) with their friends Ben and Vera Rasmussen and Dr. Raymond Boyce and his wife, Dorothy, in about 1951, probably in the Fall. Dorothy was the daughter of Ben and Vera. All six traveled in the same car  a late model Lincoln  at a time well before auto air conditioning was widely available. They definitely made it all the way to Acapulco, where they spent time on the beach, and stopped in Mexico City and Taxco on the way (or the way back). Freda would have been in her early fifties at the time. Many of the places they visited, and the six participants in the trip, were photographed by Joe Bice, who later labeled many of the photos and (perhaps with Fredas assistance) placed them in an album that was apparently purchased in Mexico. These photos have been scanned, and the most informative ones are shown below with interpretive descriptions. Shown below is the only photo in the album that includes Joe Bice, shown below on the right, next to Freda. Also included in the photo are Vera Rasmussen (far left) and her daughter, Dorothy Boyce. As noted, Joe took most of the pictures in the album, and subsequently added the labels to the photos. 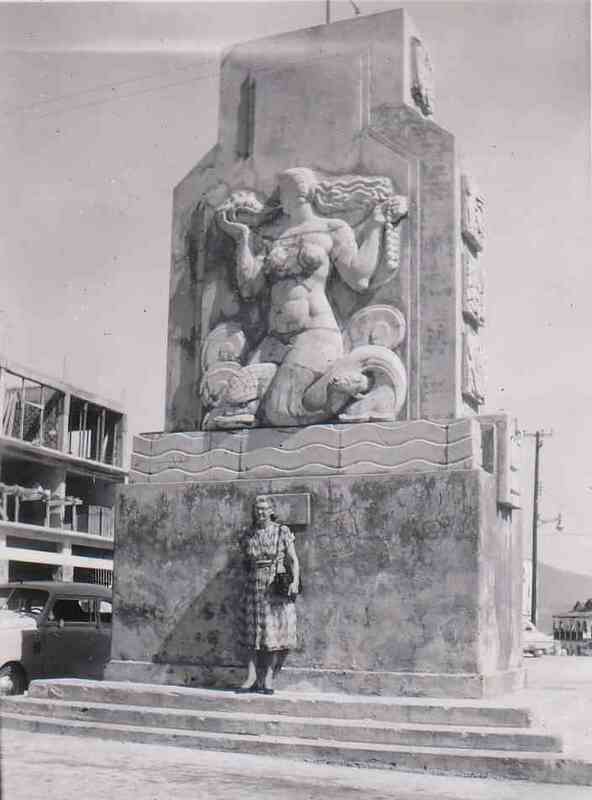 It is likely that he also bought the album while in Mexico and mounted the photos in it, although Freda may have also participated. There appear to be photos from three sources in the album  the ones Joe took, some that were apparently given to Joe and Freda (most likely by the Rasmussens), and later enlargements of photos taken by Joe. Another group photo that includes members of the party on the trip is shown below. 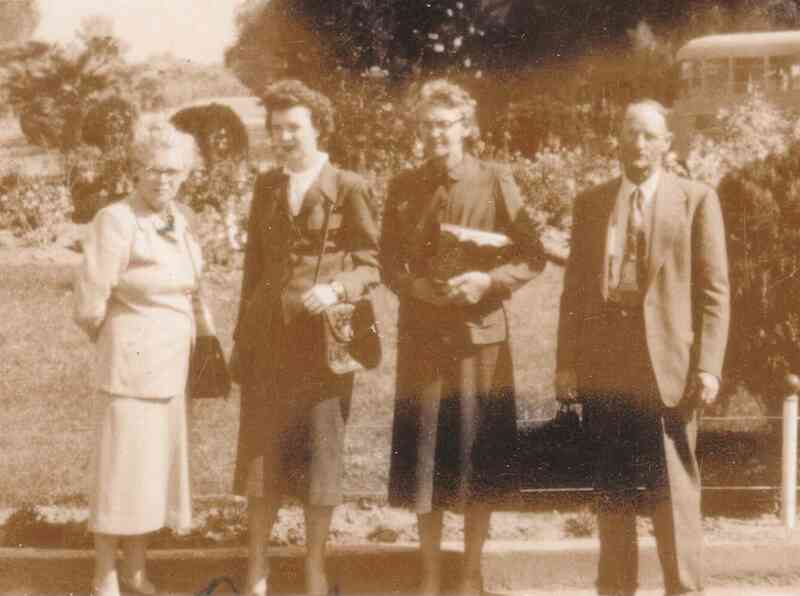 From left to right are Dr. Boyce, Vera Rasmussen, a Mexican tour guide, Freda, Dorothy Boyce, and Ben Rasmussen. This photo was taken while the party was visiting the pyramids, most likely near Mexico City. 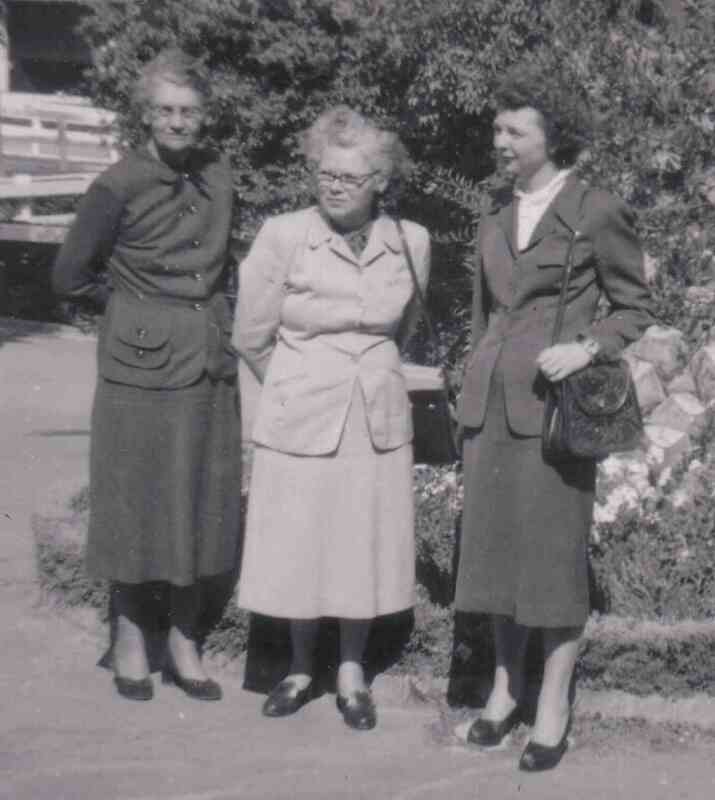 Freda, Vera and Dorothy are shown in the photo below. 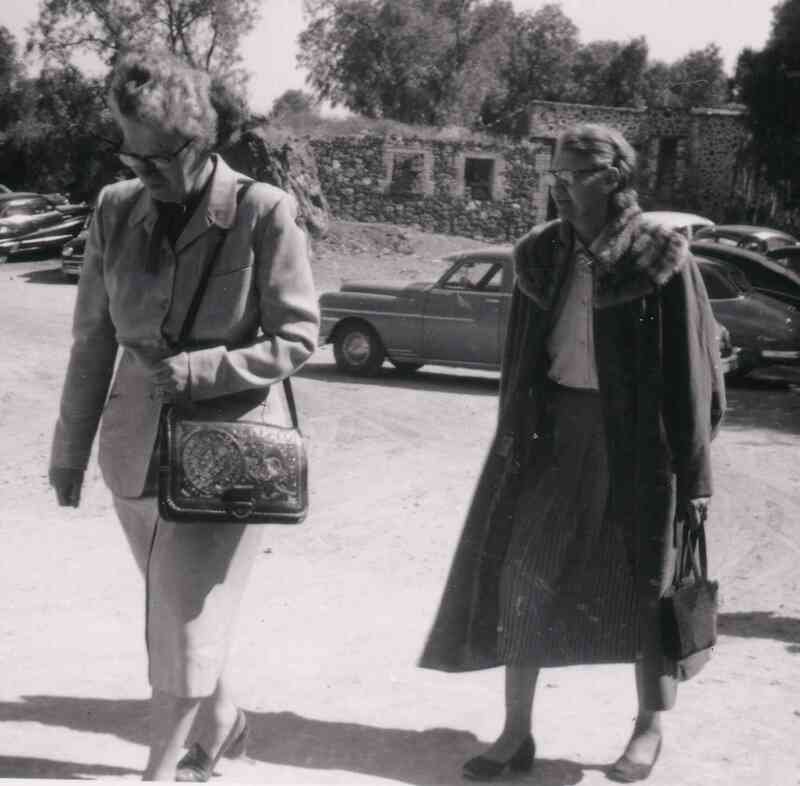 Vera and Freda are shown walking, probably to the car, below. Note Veras hand crafted Mexican leather purse, probably purchased while on the trip. 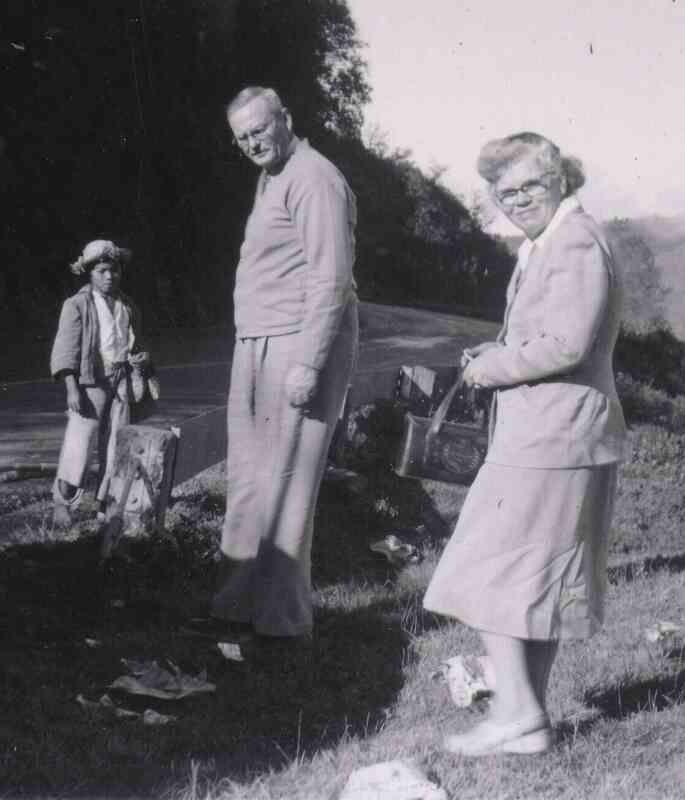 A nice photo of Ben and Vera Rasmussen with a Mexican native is shown below. This is the best photo in the album of Dr. Raymond and Dorothy Boyce. 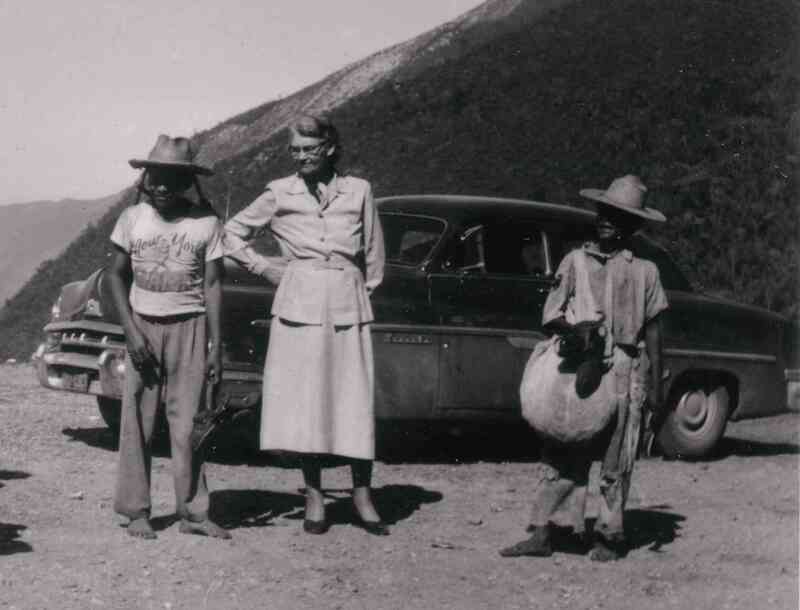 One of the best pictures in the album (in my opinion) is shown below  a good shot of Freda with some Mexican natives. It appears that the party stopped to look at mountain scenery and got engaged with some of the locals. Also clearly shown is the car that the party was traveling in. Close examination of the photo under high magnification clearly shows the word Lincoln as a chrome fixture on the car, just below Fredas left arm. 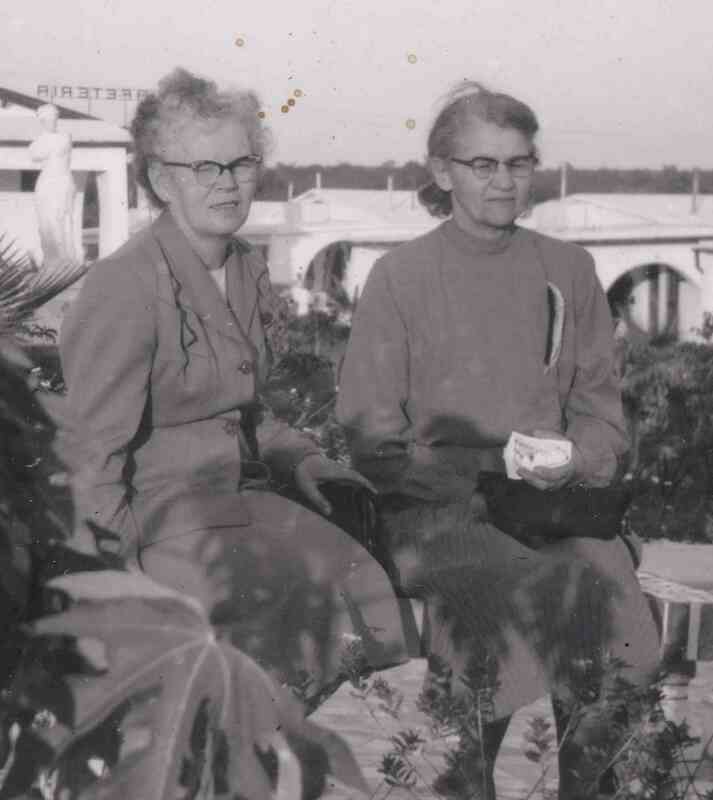 This picture of Vera and Freda appears near the front of the album and may have been taken at one of the first hotels (or motels) that the group stayed in. Apparently they were impressed with the tropical landscaping of the place. As noted, Joes labels of the photos are included when they are available. Joe took a number of cultural photos, indicating a strong interest of the group in the cultural differences they were experiencing. 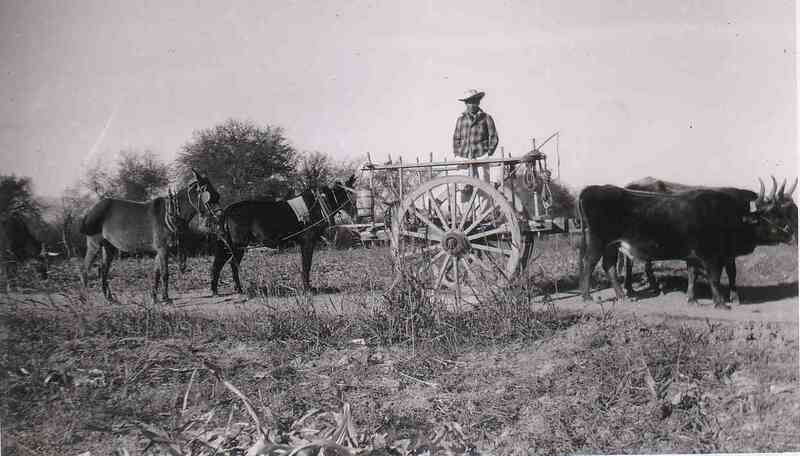 As noted, the environment of Mexico stood in sharp contrast to Joe and Fredas life experience in South Dakota  from which they seldom traveled. Maybe Joe and Freda felt like they had traveled to another planet! 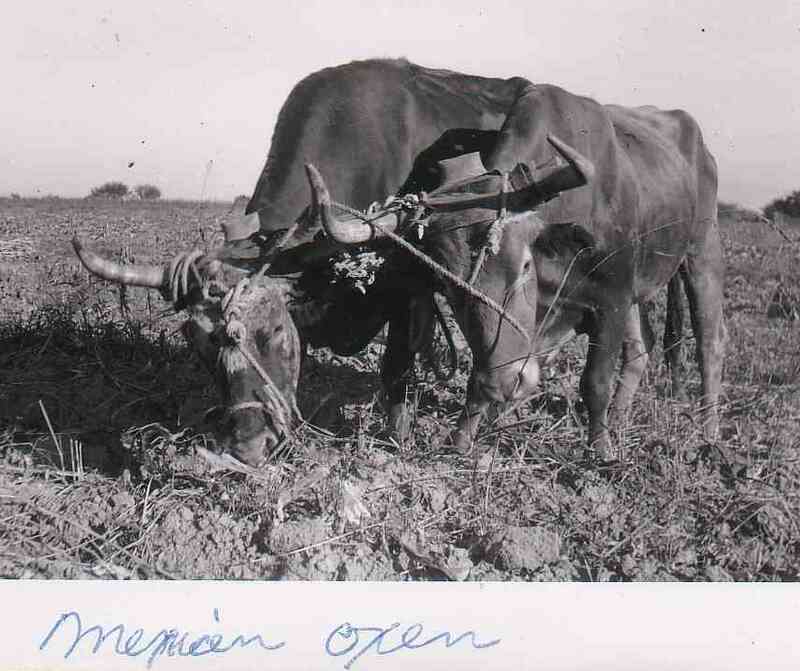 These could be the same oxen team that is pulling the cart in the photo above. 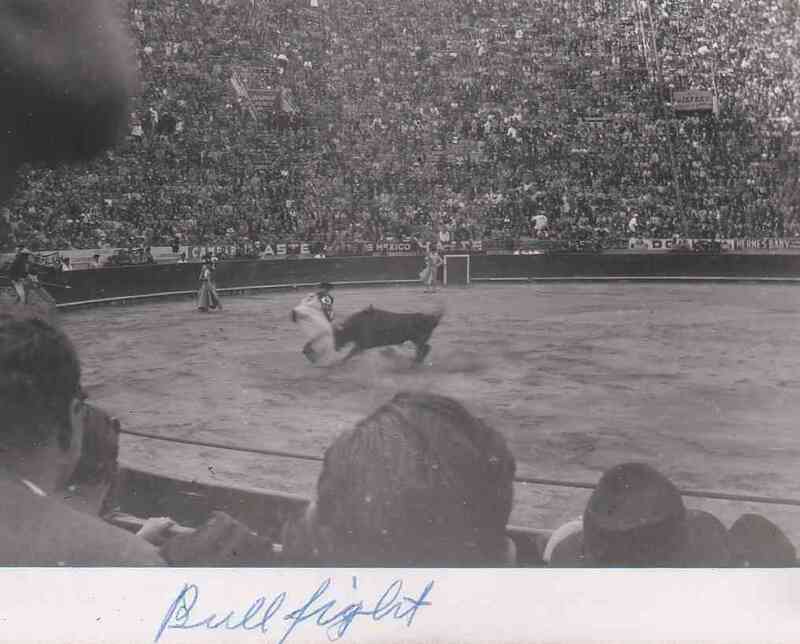 One of the mandatory tourist experiences in Mexico City in the 1950s was the bullfight. The party indulged in the experience, as indicated in the photo below. Another mandatory tourist stop in the 1950s, as now, is the pyramids. 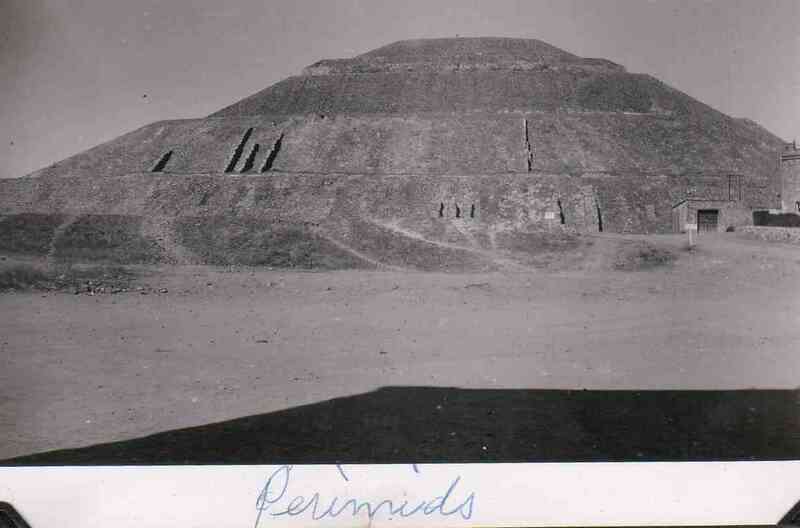 It is likely that the party visited the pyramids northeast of Mexico City. And possibly Teotihuacan, near the cathedral in Mexico City. 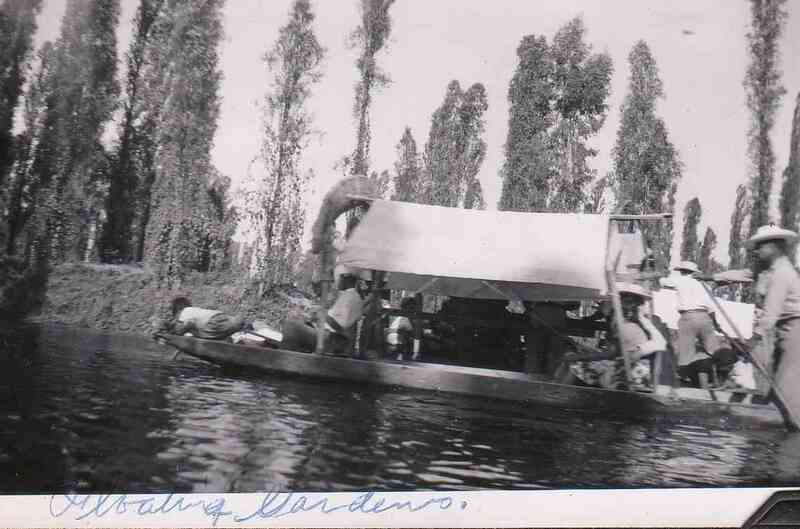 The Floating Gardens were yet another mandatory tourist in Mexico City in the 1950s as now. Sure enough, the party did make it all the way to Acapulco  quite an accomplishment in that late 1940s or 1950 Lincoln, with three in the front seat and three in the back. I suspect that the car, a pretty high-end auto for the time, was owned by the Boyces, since he was an M.D. Can you spot any Acapulcan cliff divers in this shot? (Neither could I). The final destination at last  the Pacific beach at Acapulco! 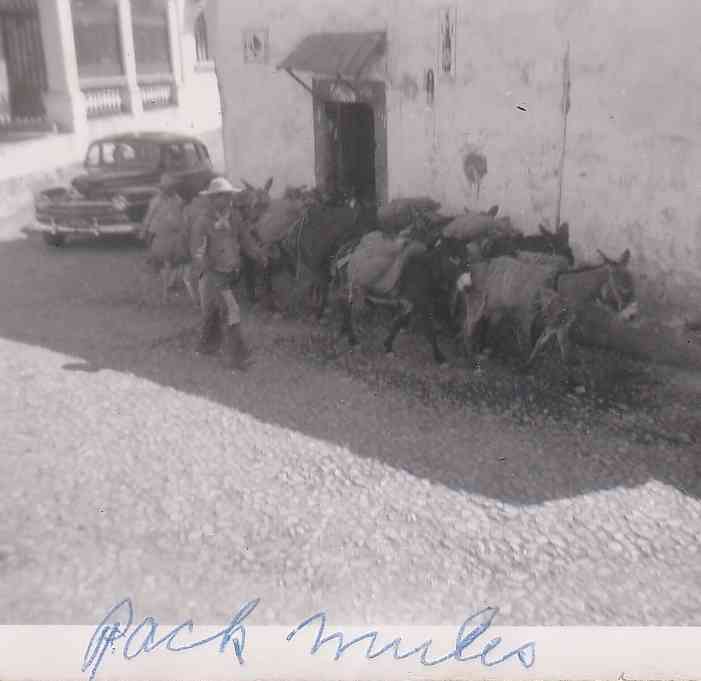 Since the photos are late in the album, it appears that the party made its stop in Taxco on the way back from Acapulco. No wonder they didnt stop on the way down  Id be making a dash for the beach too if I had been in that car for that long! (Actually, the group had already been out of the car for a few days in Mexico City). Nothing like a parade to make one feel at home in a foreign land! 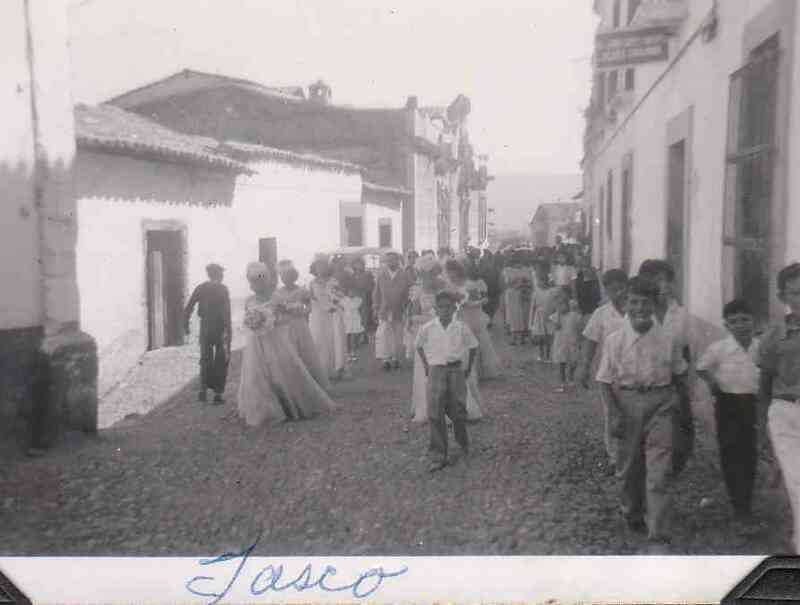 This shot, a classic for Taxco, was among the group that appeared to have been given to the Bices by the Rasmussens or the Boyces. The album containing the photos was apparently purchased while the group was in Mexico, as it has a Mexican tourist goods look and feel to it. The pages are the standard black inexpensive paper common at that time. The covers were clearly the work of a Mexican artisan. The covers are made of wood with a (hardly Mexican!) 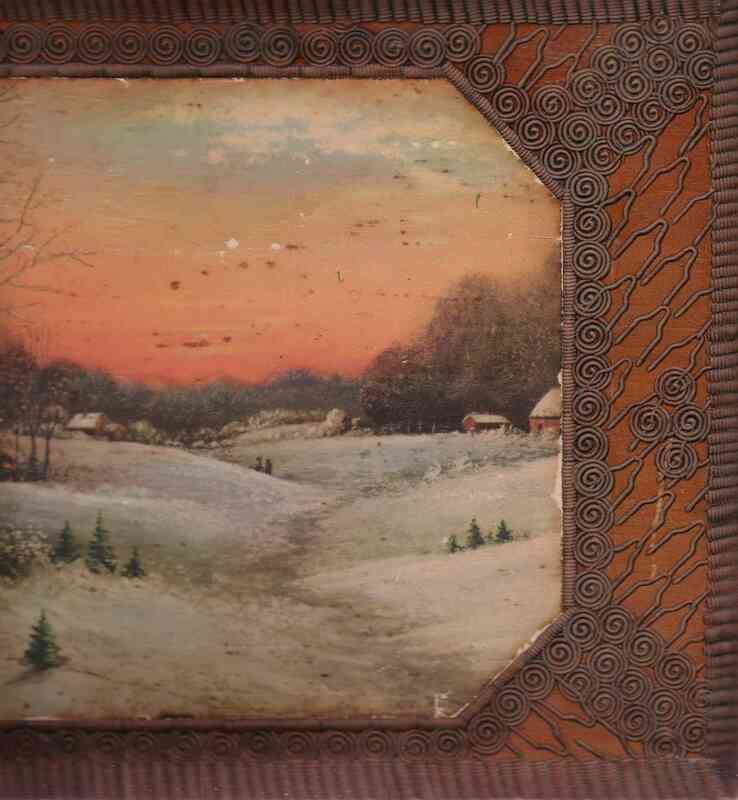 image on the cover of a winter scene in the U.S.  no doubt intended to attract a Gringo with dolares to spend on Mexican mementos. 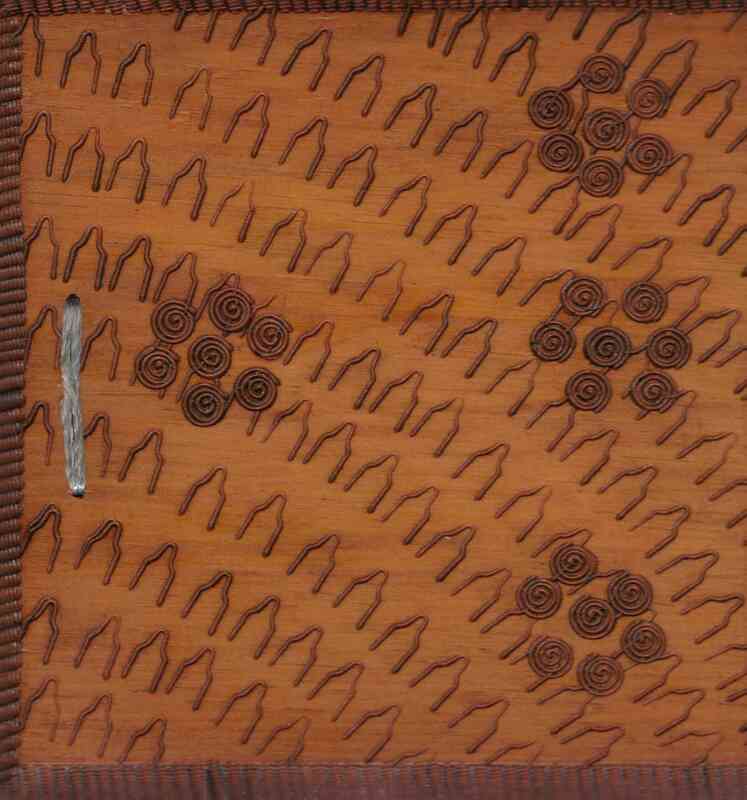 Much more interesting is the hand-crafted design, with carving of the edges and branding (wood burning) of hair-pin (human?) 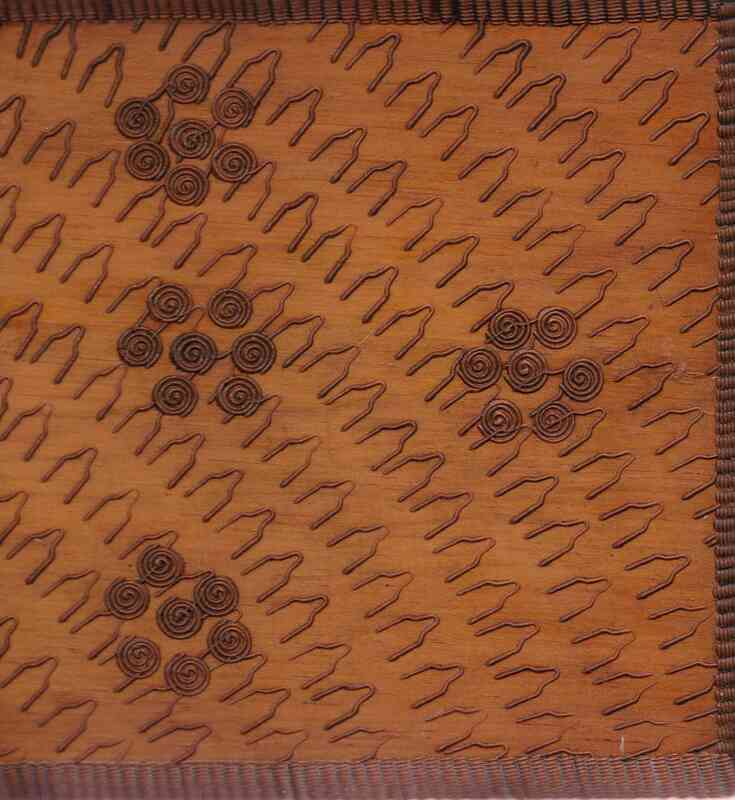 and spiral figures distributed artistically, especially on the back cover. An excerpt from the wedding gift document on the sugar and creamer set is shown below. Where did the cream and sugar service come from? Sometime in the 1950s, Joe and Freda (Sehnert) Bice made a trip of a lifetime  they drove from Oacoma, SD into the interior of Mexico, all the way to Acapulco, I believe. During the trip, they bought a number of items as souvenirs. On the road between Mexico City and Acapulco, they apparently stopped in Taxco, a silver mining town. I believe that is where they acquired this silver-plated set. Freda had three sons  two from her first marriage, to Walter Claude Grimshaw, and one from her second marriage, to Joe Bice. The sons were George and Walter Claude (later Claude Walter) Grimshaw and Stanley Bice. Thanks go to Fay and Sam Bice for providing these important mementos of Joe and Fredas family history. Joe and Freda Bice in the 1950s. The history of silver in Taxco is a fascinating combination of legend and fact. Located in the hills between Acapulco and about 100 miles Southwest of Mexico City, Taxco in the state of Guerrero is one of the oldest mining sites located in the Americas. It has retained its natural charm with its colonial ambiance, red-tiled roofs, cobblestoned, narrow winding streets and the towering, impressive 240 year old Santa Prisca Cathedral. It’s natural wealth of silver attracted early Conquistadors. Before the Spanish arrived the native Indians called it Tlacho meaning the place of the ballgame. According to local legend the Aztecs had the locals pay tribute to them with gold bars. Hernan Cortes arrived and the Spanish conquered the Aztecs in 1521. A year afterwards Cortes staked his mining claim in Taxco. By the end of the century, silver from Taxco had spread across Europe, and remote Taxco was reknowed for its wealth of silver. It had become Spain’s primary source in the New World of precious metals and had become a busy mining area. Mining gradually decreased in the Taxco area as other richer and more accessible mining areas were discovered and developed, and eventually faded out for almost 200 years. In 1716 Don Jose de la Borda (a Spaniard of French descent) rediscovered silver in Taxco, when as legend has it, he was riding and wandering in the hills of Taxco and he spotted a rich silver vein. He struck a fortune in Taxco and in gratitude built among other things (schools, roads, houses) the beautiful and now famous Santa Prisca Cathedral, an ornate cathedral with lots of gold trim in the Spanish Baroque style (Don Jose’s son served as a priest in this church). The church can be seen from all over Taxco, glitters in the sunlight and has become a focal point for the pueblo. Don Jose is still considered the “father” of Taxco, although he eventually left the area when he became over-extended, and left his mines unworked. Thereafter more than a dozen other beautiful churches were built in this small town from other successful miners. Between the 1600’s and the 1800’s Boliva, Peru and Mexico grew to produce about 85% of the worlds silver production. During Mexico’s 19th century war for Independence the Spanish barons destroyed their mines rather than lose them to the revolutionaries, and the art of silver work died out in Taxco for quite some time. 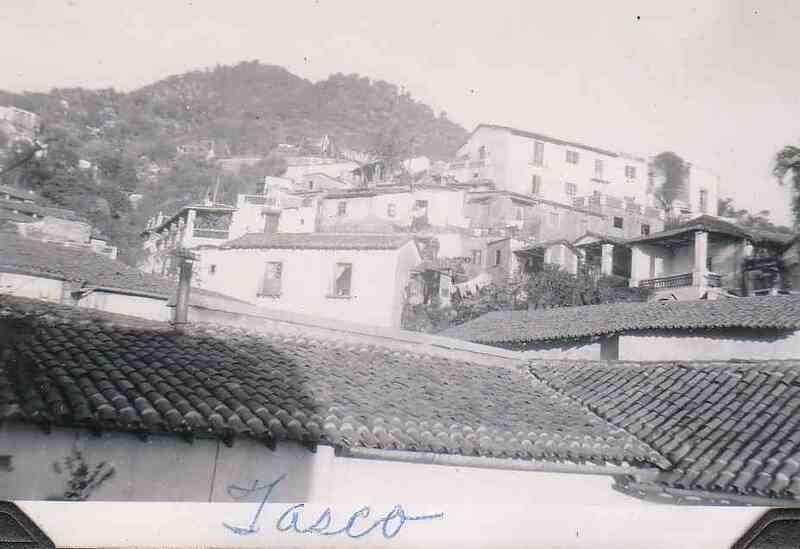 In the late 1920’s the highway from Mexico City finally reached Taxco and in 1926, William Spratling, a U.S. citizen and associate architecture professor from Tulane University arrived in Taxco to study Mexico and its culture. In1929 he moved to Mexico and was welcomed into the influential artistic circles of Mexico. In 1931 U.S. Ambassor Dwight Morrow commented to Mr. Spratling that Taxco had been the site of silver mines for centuries, but unfortunately had never been considered a location where jewelry and objects of silver were designed and made. This seemingly insignificant comment changed the course of Taxco’s artistic and economic history. Mr. Spratling discovered the potential talent in the locals and motivated the community artisans to create designs and rediscover the craft of silversmithing. With his own designs he created an apprentice system of training young silversmiths with artistic talent and gave them the opportunity to develope their skill. He brought in from Iguala a highly regarded goldsmith to teach the art of working precious metal. The great beauty and craftmanship coming out of Taxco earned worldwide recognition and fame once again for Mexico. Over time many of these artisans opened workshops and stores of their own- all encouraged by his unwavering support. Now considered the great old masters of Mexican Silver, Mr. Antonio Pineda along with former fellow apprentices the Castillos, Ledesma, and Chino Ruiz have produced and continue to craft some of the most highly regarded, collectable pieces of art, vases, serving sets and jewelry. Their work continues to inspire the next generation of silversmiths and artisans who now number in the hundreds. William Spratling passed away in 1967 due to a car accident just outside his beloved Taxco. Throughout Mexico Spratling is widely regarded as “The Father of Mexican Silver”. A silver bust of Mr. Spratling resides in the town’s silver museum, alongside images of Don Jose de la Borda, and The Spratling Museum behind the Santa Prisca Catherdral, houses the Spratling Collection of silver and Pre-columbian figures that he left to the town of Taxco. For more information about Spratling visit the www.SpratlingSilver.com website. When in Taxco you may want to visit the Spratling Museum, the Museo Virreynal de Taxco (3 stories divided into sections showing different periods of time and people in Taxco’s history, many artifacts displayed were recently found in a hidden chamber of a local church during restoration), and of course don’t miss the Santa Prisca Cathedral. 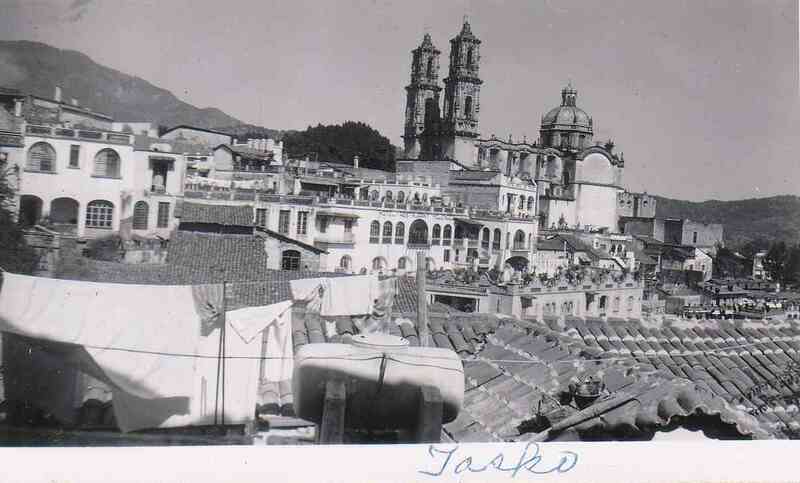 Visit the www.taxco.com website for more about what is going in Taxco today, and learn more about the interesting history of silver in Taxco. 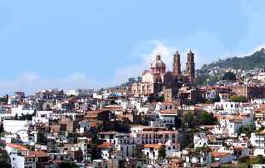 Taxco is located on the main highway from Mexico City to Acapulco. Webpage posted January 2009. Updated February 2010 with change in type font and addition of better header.